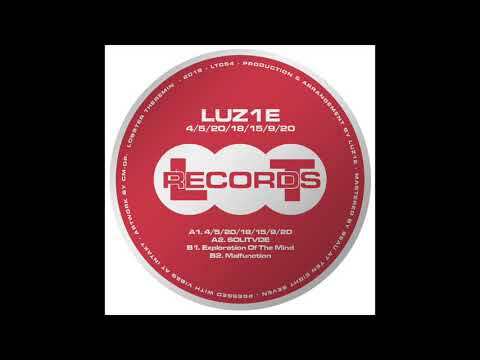 By now you’d think we’d have heard more from Frankfurt’s LUZ1E considering the wealth of self-releases uploaded to her SoundCloud page (and other alias pages). Sure, some of them play more like ideas, but a majority of them are fleshed out tunes that show her innate talent for songcrafting. After a strong initial public offering on UGONGETIT, LUZ1E side steps to the Lobster Theremin main label with a hard-hitting, drum machine focused EP of lush electro that traverses bpms and sonic realms. The title track, “4​/​5​/​20​/​18​/​15​/​9​/​20,” is a spacey, bass driven cut that features a warm wash of purifying synths. Nothing too complex here, just a solid groove and a meditative repetitiveness perfect for those intimate after-hour scenes. This is a track with the bare necessities, proof that complex sound design or OD instrumentation doesn’t necessarily equate to more effective club tracks. The rest of the EP plays out in similar fashion, save for a murky final track that doesn’t feel as lush as the rest of the project (not a bad thing). LUZ1E’s second LT release ships out on October 5. Get your hands on it!